Special occasions deserve to be celebrated on extraordinary venues and Lalezar Restaurant of Jumeirah Zabeel Saray hotel is well worth to march out at the western crescent of famous Palm Jumeirah. Because this fine eatery not only have the most outstanding and elegantly designed interiors, but it also serves exceptionally delicious regal Turkish fare. Management has set up both reclining and traditional chair, table seating in this restaurant out of which guests can prefer to sit any where they like to. Plus there is a beautiful decorated outdoor area in this establishment from where guests can take pleasure in the spectacular views of Palm Jumeirah, while consuming delicious dishes. Traditional Turkish mixed grills, platters of fish or meat can be found on the menu of this fine eating place in Palm Jumeirah. Plus main course also includes some contemporary-style Turkish dishes such as grilled halloumi cheese, doner kebabs, Kadin budu kofte, Iskender kebab, chicken skewers, lamb chops, Ottoman style stew and sea bass. All these dishes are cooked to perfection and then presented to the diners in nice fashion with nice seasoning. The food is absolutely delicious, but still it is advised that diners should leave some space for desserts, as their sweet dishes and home-made style Turkish ice cream are also astonishingly scrumptious. In addition to this, nice collection of Turkish wines are also available at this bistro along with fresh juices and some other regular drinks. Service provided by the waiters of this venue is first-class, as they are faultless and are also well familiar with the composition of each dish prepared in this restaurant. 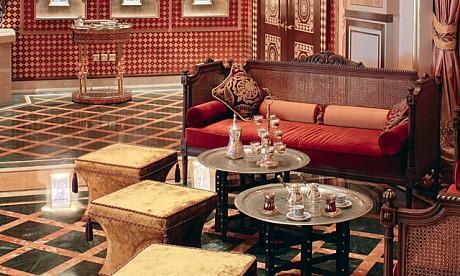 Lalezar opens on all seven days of the week and activities take place at this establishment from 3:00 pm till midnight. Jumeirah Zabeel Saray, The Palm Jumeira - Dubai - United Arab Emirates. Since Lalezar Restaurant at Jumeirah Zabeel Saray hotel sits on the western crescent of the Palm Jumeirah Island, therefore best option to reach this site is by car because all bus stops and metro stations are way more than 2.5 kilometers walk from this eating place.